Socks and sandals! My way. The newest pair of Luna Sandals comes with some great new features and some issues. The Origens are based off of the original Rarámuri (Tarahumara) sandals made out of tire tread and leather straps. Because of that the Origens are sturdy, solid sandals. Made out of up-cycled tire tread with a vibram midsole this sandal has an almost wave like tread pattern. The vibram midsole provides flexibility and support, while the tire tread provides a durable, dense base. I don't foresee the tread wearing out any time soon. The MGT (Monkey Grip Technology) provides a rubberized top that really connects and holds your foot down and into the sandal. The traction and durability it gives performs best in wet or muddy conditions. I buy all of my sandals with the Performance Laces. With their cushioned heel strap, durable nylon, comfortable design, flush and protective outsole plug I find these straps to be the best for trailrunning and even the everyday. 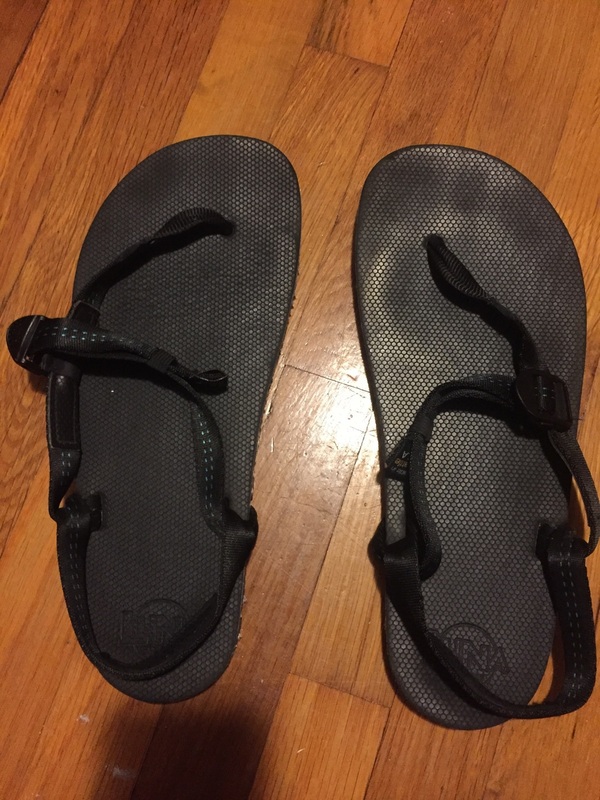 The everyday is what I use these specific sandals for. Because the only complaint that I have is that they weigh in at 8.6 oz (single sandal, Men's size 9) which is not light. Because of that I find that it becomes to cumbersome for running and wearing out and about is more applicable. I do love these sandals though, because I know of their amazing craftsmanship and design they will last for a very long time, especially if the only abuse they are getting is walking around the city. So I do highly recommend the Luna Sandals Origens as a beautiful and tough piece of footwear.